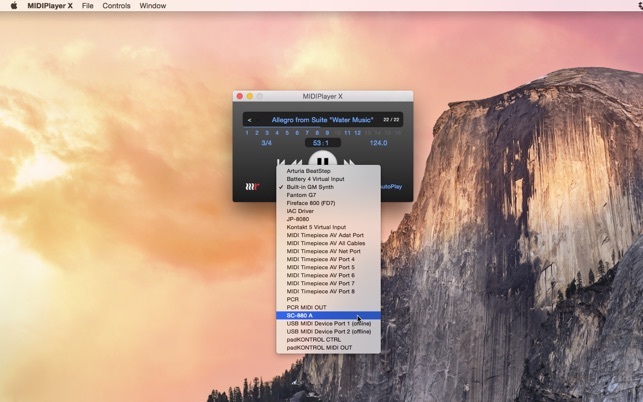 The fastest, easiest way to play MIDI files on your Mac. MIDIPlayer X will play any MIDI file to your choice of available MIDI outputs, either hardware or software, or to its own built-in GM-compatible virtual synth. Fast and elegantly simple to use via drag and drop – whether you need to check a single .mid file or audition hundreds, there's no faster easier method than MIDIPlayer X.
MIDIPlayer X let’s you rewind and fast forward through your MIDI file. You can step through measure by measure or quickly jump to any location in the file with a simple mouse click. The counter provides a precise reference point, either bar : beat or min : sec, for location within your song. Flexible AutoPlay modes let you control if a file begins playback immediately when it is selected or waits for you to press play; repeats the selected file continuously; or automatically moves to the next file when the current file ends. With MIDIPlayer X, you can change the playback tempo, plus mute or solo individuals channels within a MIDI file. After making any changes, you can save a new MIDI file with your edits. The next time you load your new file into MIDIPlayer X, your desired tempo and track mutes will load as you saved them. 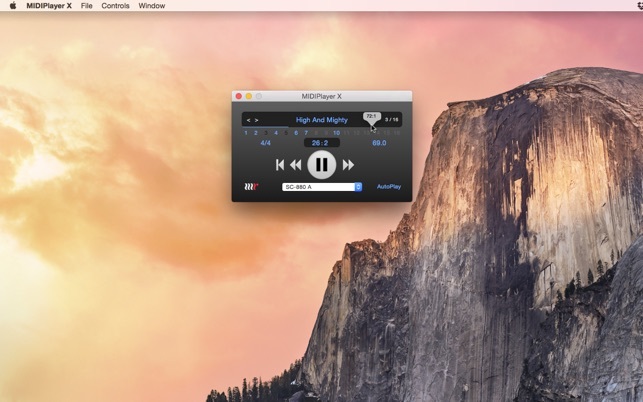 MIDIPlayer X accepts multiple files and folders via drag and drop, along with intuitive key commands to let you move efficiently through many files. Show in Finder let’s you quickly reference where you loaded any file from. MIDIPlayer X works with virtually all commercial MIDI hardware and software. It will auto-locate all available MIDI outputs, both hardware and virtual, so you can select your desired sound source. Easily switch playback between an external keyboard or sound module, or to other software instruments and apps inside your Mac. MIDIPlayer X includes its own software synth using Apple's CoreAudio technology. So even if you have no other MIDI hardware or software available on your Mac, you’ll always have a 16-part multitimbral, GM-compatible synth available. Simpy drag a file, a few files, a folder, or even multiple folders, from the Finder and drop them on to MIDIPlayer X. MIDIPlayer X will remember your last MIDI destination, and can automatically start playback eliminating extra clicks or keystrokes. MIDIPlayer X is especially handy since the Mac no longer plays MIDI files from the Finder. MIDIPlayer X will display file information, such as title, tempo, time signature, as well as active MIDI channels and System Exclusive data. • Patched a crash that could occur when playing files containing SysEx. • Fixed an issue that could cause the wrong output to be selected on launch. • Updated minimum requirement to macOS 10.12. Gut durchdachtes schnelles Programm ohne unnötigen Ballast. Loopt verzögerungsfrei und funktioniert einwandfrei, auch mit externen Midi-Klangerzeugern. Auf diese App habe ich Jahre gewartet. Midi Files ohne viel Aufwand abspielen. Nach dem Update noch besser mit neuen Features. Bester Player für den Mac!